A quiet little pocket of Kitsilano sits along West 1st Ave between Burrard and Cypress, just off of the south end of the busy Burrard street bridge. It’s a beautiful area to explore by foot and just spend a few hours wandering the shops or walking to the nearby park and seawall. 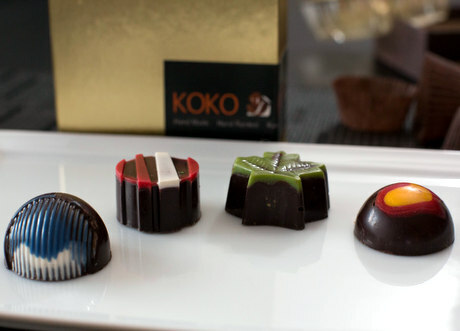 A number of small local businesses call it home, including a great little neighbourhood restaurant (Kitsilano Daily Kitchen), a goldsmith and jewelry designer (Costen Catbalue), a boutique flower shop (Hilary Miles), and a small chocolate shop and café which specializes in handmade moulded chocolates (Koko Monk). 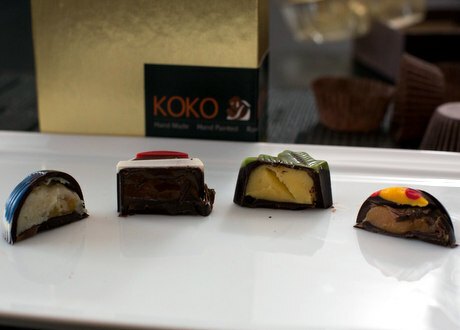 Recently a number of local food writers and bloggers were invited to KoKo Monk to meet Paul and taste his chocolates. I love meeting the people behind our local food community and learning about their backgrounds. 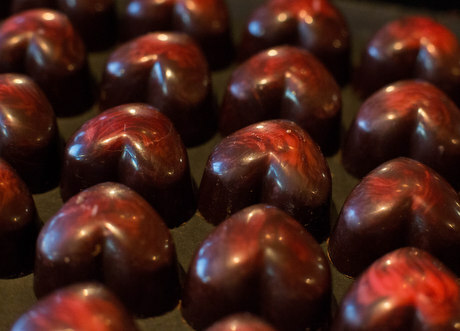 Paul’s route to chocolate is a more unusual one, and it was interesting to see how his previous life as a professional creative writer is influencing his current one as a chocolate maker. 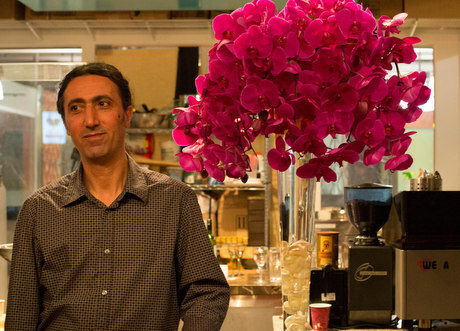 He is originally from Turkey but learned the craft of chocolate making in Australia. 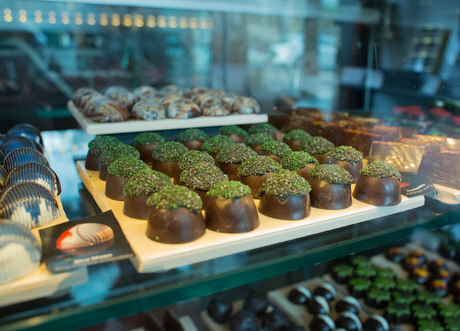 Though his style of chocolates is European in origin, Paul likes to welcome people into his shop with Turkish hospitality. 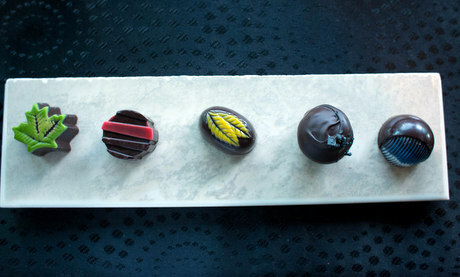 Each chocolate has a little story, and Paul’s descriptions are poetic and romantic. I have been to the shop on my own and the staff there are warm and friendly, and happy to answer any questions you may have. In addition to chocolates, you can also try authentic Turkish coffee and a variety of handmade cookies. 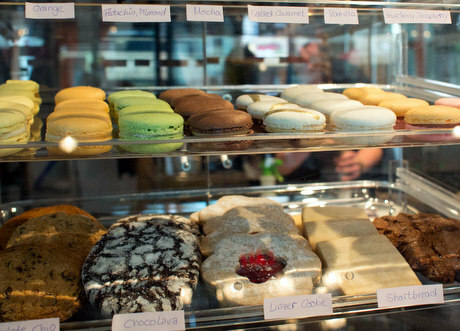 The Macarons are made by Paul while the rest are made by German chef friend. Paul’s specialty is creating fillings with multiple flavour components, some of them very unusual. The combination of flavours in each chocolate are meant to tease, to be playful and entertaining. He only uses dark chocolate for the tempered shells and he combines multiple types together make his own custom final blend. 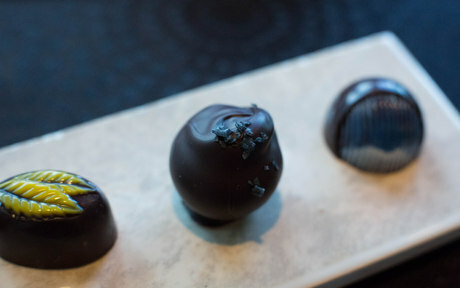 He takes chocolate made from Trinitario cocao beans that are mainly from Central and South America, and mixes them with Callebaut couverture chocolate. (There are three primary varieties of cocao beans used in the world’s chocolate production: Criollo, Trinitario and Forastero. The highest quality beans tend to be of the Criollo variety, while most of the mass produced chocolate is made from Forastero. Trinitario is a hybrid of Criollo and Forastero.) The fact that Paul makes a custom blend is quite unusual; most chocolate makers will use only use one type of chocolate at a time. I think the hand tempering allows Paul a bit more freedom in this regard but it also makes the process more labour intensive as different chocolates will temper slightly differently. I was impressed that he would go this extra step and it shows the dedication to his craft. At the event, we were guided through a blind tasting of some of Paul’s signature creations. Paul instructed us to taste by placing the chocolate in our mouth, taking a bite and then letting it slowly melt in our mouth while trying to pick out individual components of what he had used in the infusions. (The Bacchanalia must be eaten whole due to the liquid caramel filling but the others can be bitten or cut in half. The important thing is to savour the taste, and to not chew the chocolate.) Overall I found the flavours to be rich and intense, with a strong upfront hit of the primary flavour followed by hints of secondary components. I really enjoyed trying to guess what was used in each chocolate and it was fun to share our ideas and guesses amongst the group. The fillings are made from fresh ingredients with no preservatives, so they only have a shelf life of 6-8 weeks. To Paul, flavour is everything so the sooner you eat them, the better! The lemongrass flavour was the strongest, and I thought I could also taste ginger or something with a spicy heat. The texture of the filling was very smooth. This was Paul’s newest creation and I could taste wasabi, ginger, and small bits of orange peel. The texture was denser and slightly coarse. This was one of my favourites of the evening. I could taste both the coconut and curry flavours and they were nicely balanced. This truffle is made with a 12 year old balsamic vinegar so there are flavours of sweet, acidity, salt and dark caramel. The filling is a liquid caramel so it’s best eaten in one bite. This was one of the most intensely flavoured chocolates of the night. The blue cheese is quite strong yet smooth, and is balanced out by the sugar. It reminded me of stilton cheesecake. The filling also had some small pieces of pear. A Banyuls port was poured as an accompaniment to the Blue Moon. 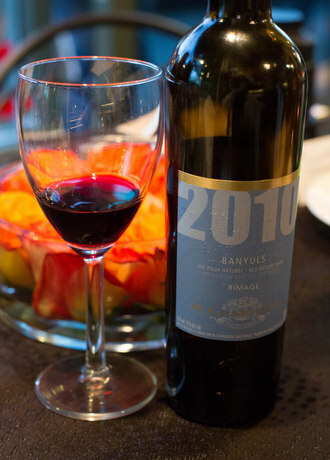 Banyuls is a sweet French fortified wine and is one of the classic wine pairings for chocolate. (Port is another.) The Banyuls was the ideal complement to the dark chocolate, blue cheese and pear flavours in the Blue Moon. 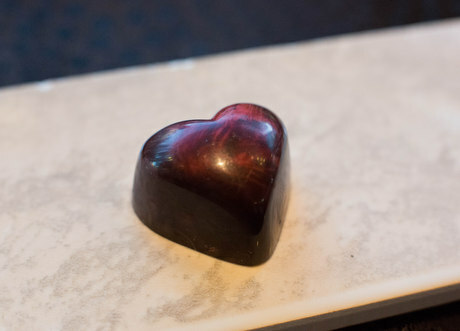 We also had the opportunity to taste Paul’s most expensive chocolate, the Smoking Heart. 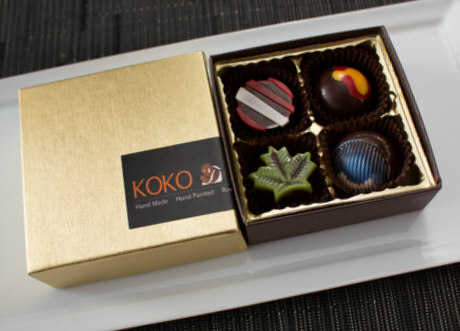 These special chocolates are stored in their own sealed box, to help the aromas from their double smoking process. The filling contains raspberry, guava, coconut and mango that is infused with scotch and smoked. 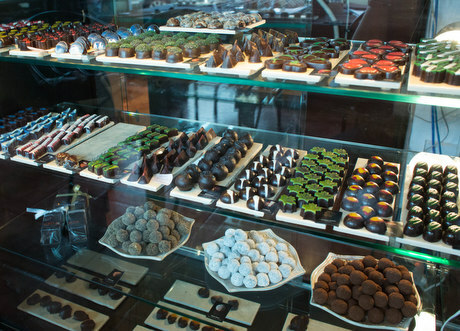 Once the chocolates are made with the filling, the chocolates themselves are smoked. The chocolates have a strong smoky taste at the beginning which reminded me immediately of scotch, and then there’s a fruity finish at the end. At the end of the evening, we were given a small box of chocolates to take home. 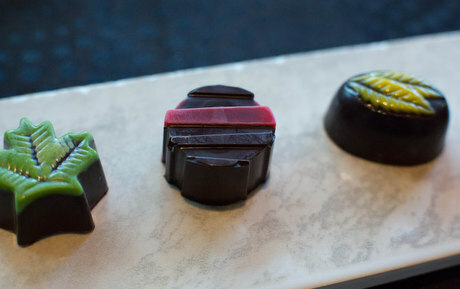 I did my own little mini-tasting with these chocolates but this time I was able to ‘dissect’ them a little more and re-check my tasting notes for a few of them. When I cut the chocolates in half, it was very interesting to see the variation in colour and texture between them. It was clear that these were made in individual batches with care and attention to detail. Making a different type of filling for each chocolate is far more labour intensive than starting from a common base and adding extracts. I look forward to seeing what other creations Paul will come up with. In addition to chocolates, he is also planning to offer Turkish Delights and Turkish pastries in the future. Chocolate Arts Holiday Extravaganza /Curry in my chocolate /CocoaNymph – raising the chocolate bar!